Last summer I went through a massive phase of trying out Origins products. 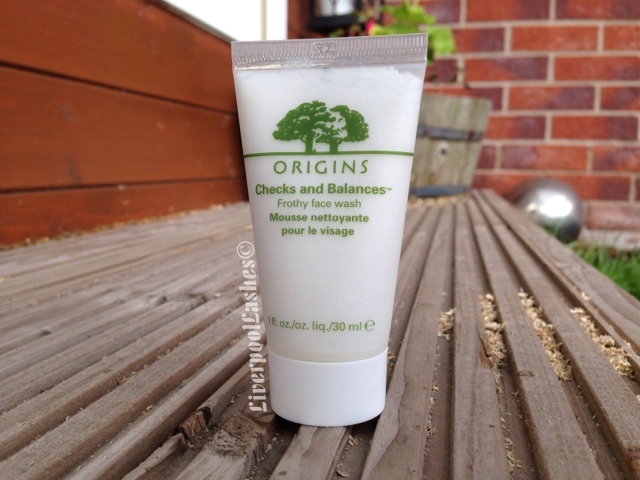 It's a brand that's highly raved about between You Tubers and Bloggers so when my friend Leanne sent me Origins Checks and Balances Frothy Face Wash to try out I was delighted. I love the concept behind this product. The idea of it is that it's for combination skin (which accounts for something like 80% of the population) to balance out the dry and oil areas, therefore doing the two jobs without cancelling each other out. The scent of is clean and like a herbal mint. Origins do claim that your skin should not feel tight and more of a comfortable refreshed feeling which I must admit I don't experience. My face was left feeling cleaning however the skin on my face is a little more high maintenance and every time I get out of the shower or wash it I still have to race to put on a moisturiser or it gets a little irritated and dry. I do like this face wash although I do have a nagging thoughts about what Caroline Hirons (queen of skincare) said about products that froth dry your skin out. I wouldn't say it did anything amazing to my skin to be fair although I'm not entirely sure it's meant to. I'd be on the fence as to whether I would buy a full size version of it as it just didn't wow me but equally, it does wash the skin and is a fairly pleasant experience. I hope that makes sense? !